There are many affirmations I could wish for you, but I share this one that I believe we should all embrace..."Be easy on yourself." 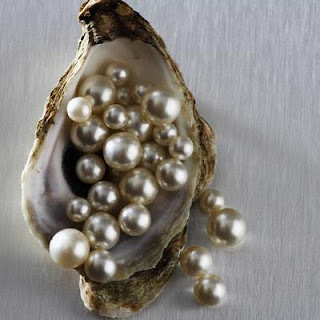 Like the grain of sand that finds it's way into an oyster shell and slowly, without effort becomes a coveted pearl, going forward, live your life as gently as that single grain of sand. 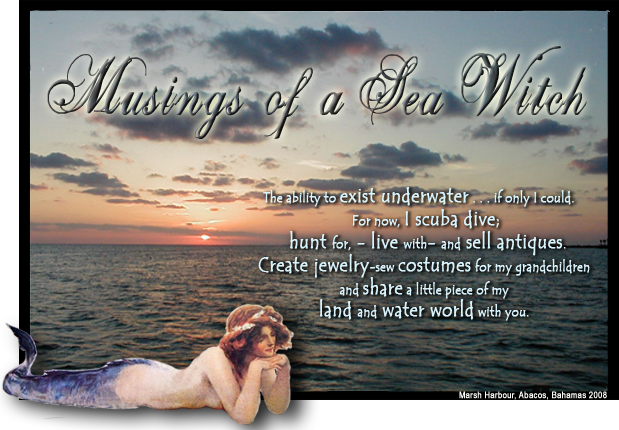 Your beauty is within and will become that uniquely beautiful and one of a kind, lustrous pearl. I couldn't. It wasn't my fault. It called to me. So I went back. 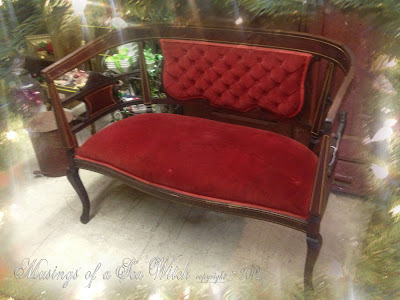 I made another drive to Monroe, Georgia and Davis Street Antiques and returned with two pieces I fell in love with from my friend's booth. 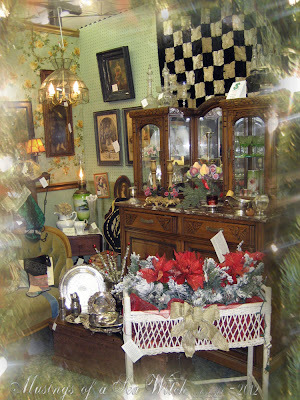 Yes, those two beautiful pieces...the crushed velvet wedding gown and that marvelous "married" parlor table. There are three big antique malls in Monroe, but by far, my personal favorite is Davis Street Antiques. 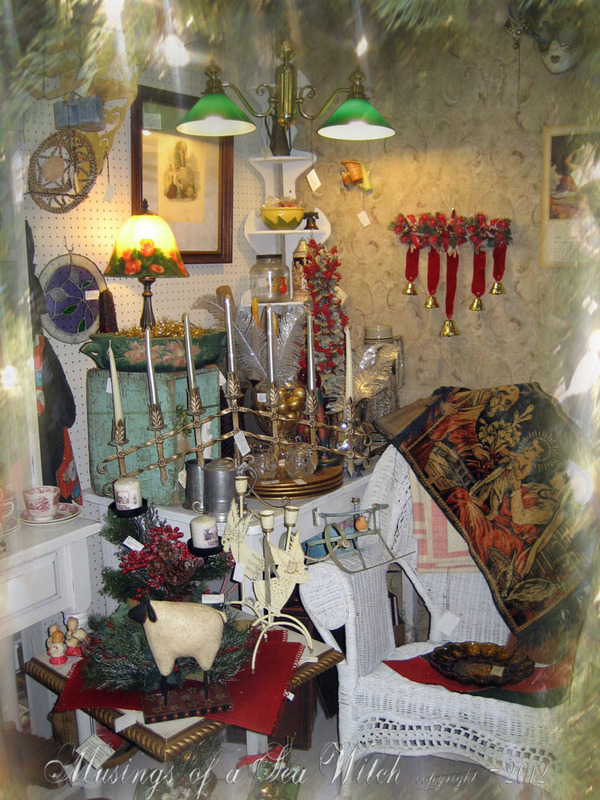 As owner, James shares, it is "a place that offers reason to stop and linger.” Davis Street Antiques truly is a place to linger. 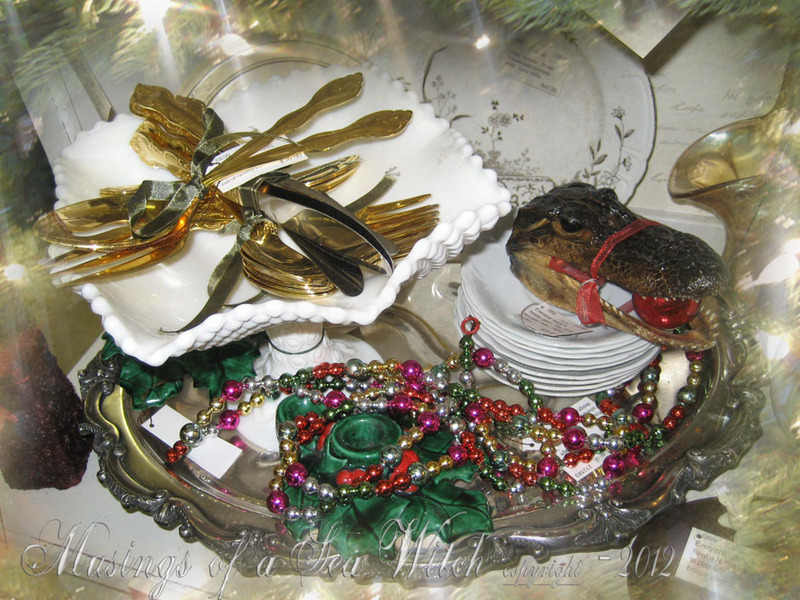 Beautiful pieces fill the many booths and you will always find something to take home. Photos were taken with my iphone as I had forgotten my camera. Please forgive the less than high quality. 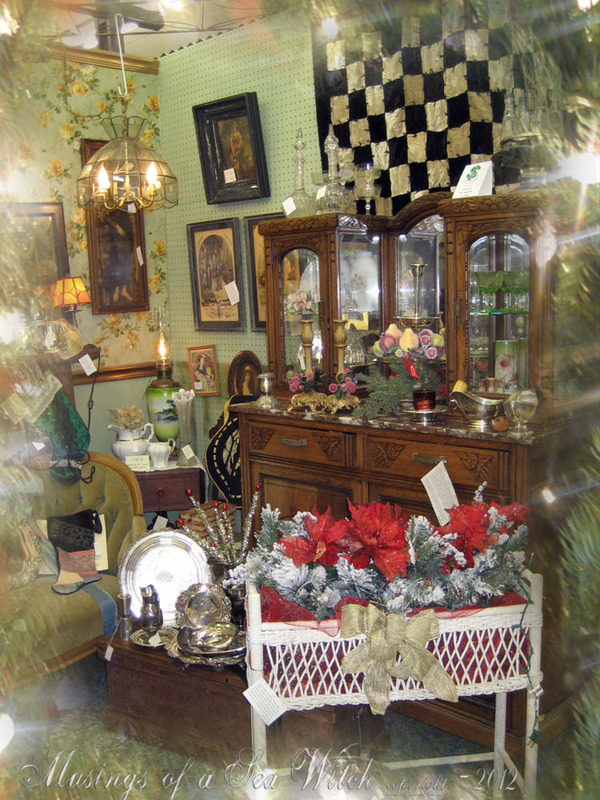 The front check out space is surrounded by seasonal vignettes. Real mistletoe, a candle lit jar, and old fashioned Christmas cards reside in a vintage suitcase. Found pretty transferware bowls and plates. One of my favorite items to collect and sell. 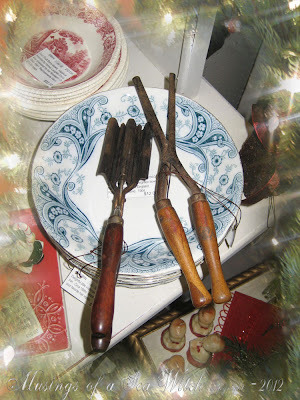 What I really enjoy about Davis Street Antiques are the dealers. They mirror the decorative eye of the owner and you will find delightful little pieces that are repurposed into decorating elements throughout. 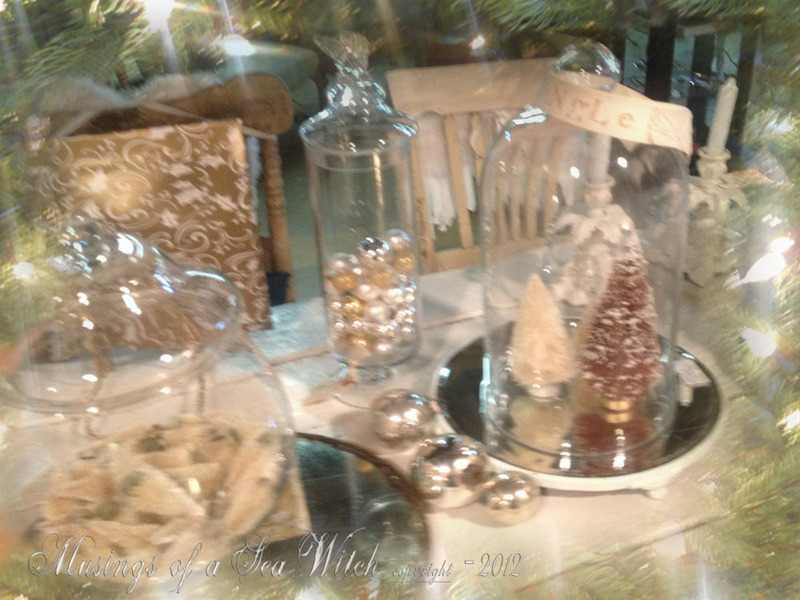 The purity of glass provides intimate little settings for your favorite antiques and collections. I like the simplicity of objects when they are paired together. Very Georgia O'Keeffe in its arrangement. Sweet antique shaving mirror with comb box. 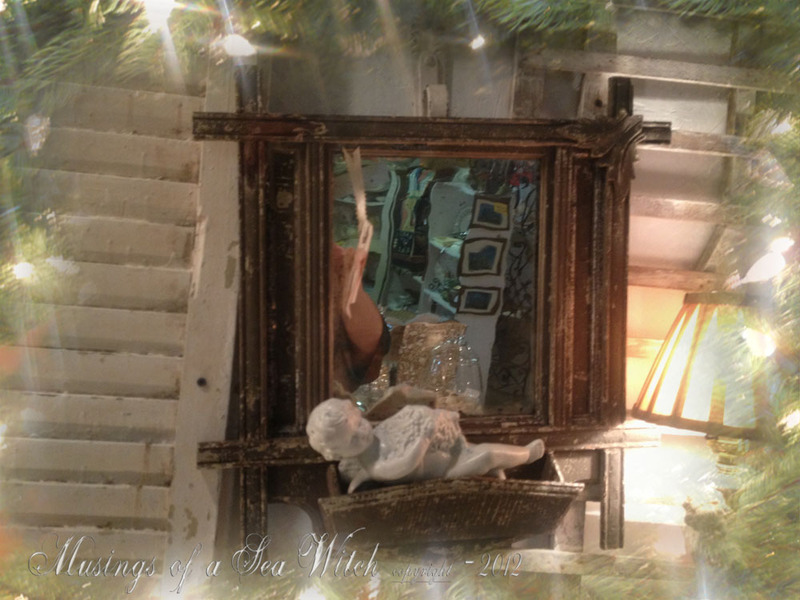 The perfect place for a cherub to relax. 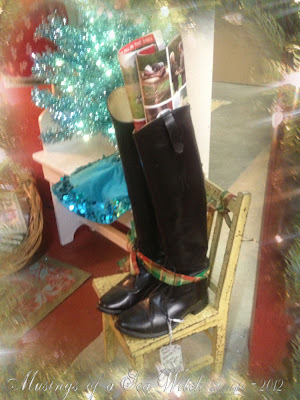 These riding boots make the perfect display for your favorite seasonal magazines. There is something so gentle about an antique cutter quilt repurposed into a stocking. How many generations were kept warm with this quilt and now that warmth is shared again with a place for gift giving. 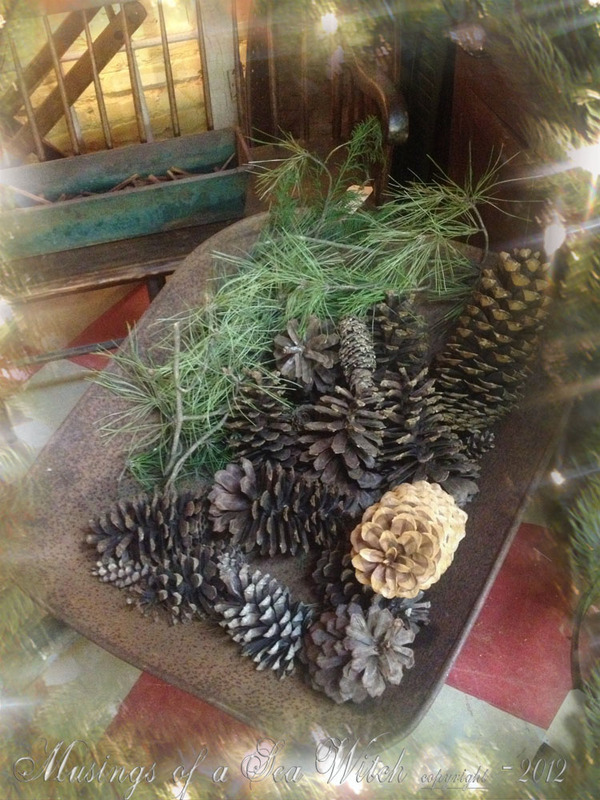 Who doesn't love an old wheel barrow full of pine cones and boughs? 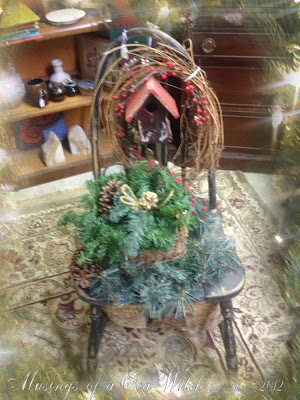 It makes such a welcoming display to your home or business. Fell in love with this pretty little settee and it was priced for the taking. I had to really talk myself out of it as I had no room for it, but darn...I really wanted it. There was no talking myself out of this piece though. I saw it a few weeks ago and my heart began to race. 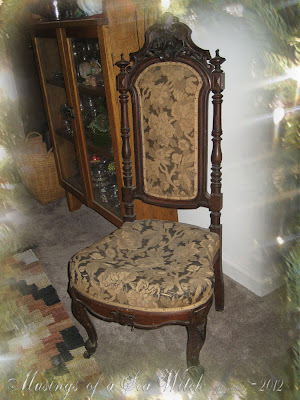 Black walnut with original finish intact and original tapestry upholstery. Does have seating issues, but that is an easy fix. A gorgeous slipper chair that I can use as a spinning chair. Yes, I spin fiber and have been using a milking stool for decades. You need a low chair to sit in or you develop back issues from "hunching over" a wheel. Now, a slipper chair is any sort of armless, upholstered chair that sits low to the ground (around 15 inches, vs. the usual 17 to 19 inches), usually with a high back and wide seat; dating from the first quarter of the 18th century - an item for the boudoir or bedroom, it allowed a lady to assist her in getting dressed. The slipper chair flourished in the 19th century and experienced a revival in the mid-20th century. 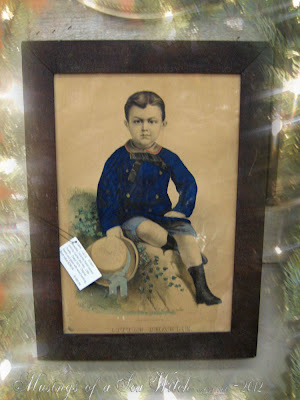 This lovely piece is an early one, pre Civil War. I am thrilled with this find and will look forward to sitting in it while I spin. 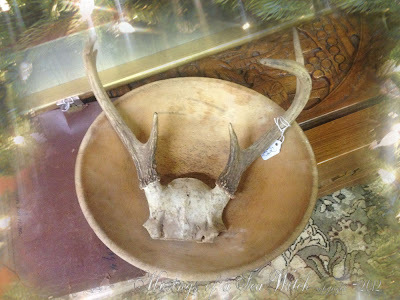 Now you can see why Davis Street Antiques is one of my favorite places to visit for decorating ideas and antique treasure. This past weekend brought delightful weather to the Atlanta area. Can you say 70s temps? It was more like May then December and so folks were still having yard sales. Hit a few on the way back home and found a little treasure. A pair of sun purple and heavy glass flower frogs. 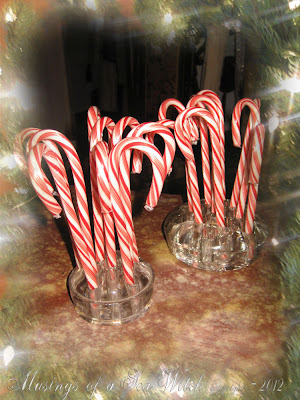 I think they are perfect for offering candy canes to friends. Pretty vintage carnival glass 12 Days of Christmas plate. 1970. A pair of Victorian hair items...a curler and a crimper. 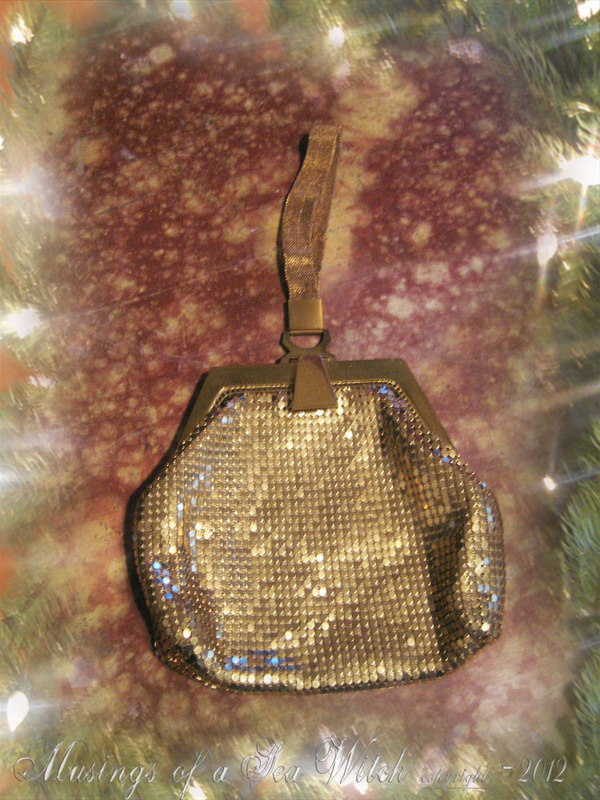 Perfect gift for your favorite stylist. Fabulous Whiting and Davis flapper era mesh wristlet bag. In lovely condition with lining intact. I wonder how many "juke joints" and southern speak easy's this found its way into. 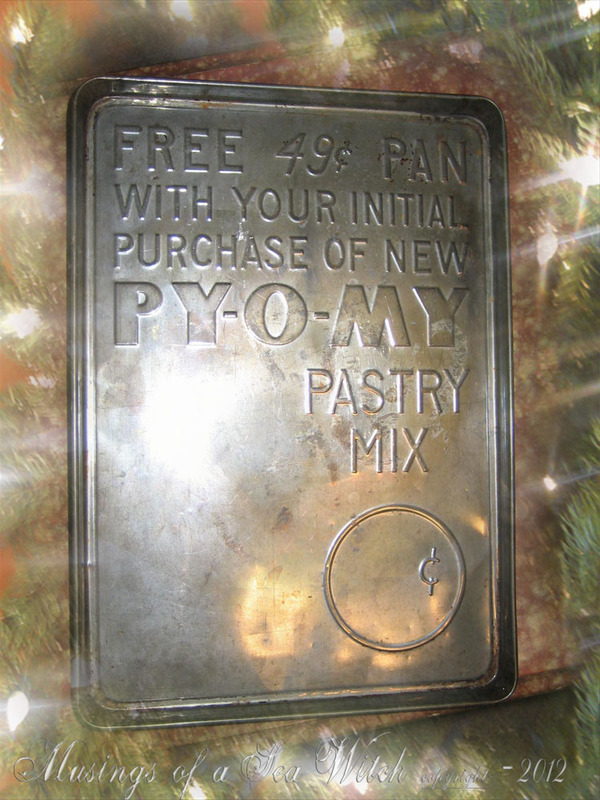 Okay, how cool is this cookie sheet. Looks like it has never been used. 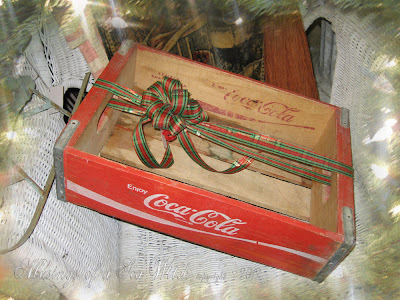 My sister's vintage Coca Cola wood box in as excellent condition as a collector could possibly want. Like a true collector, she has decided to move this piece on to another. That is the beauty of living with antiques, you can sell off a piece and upgrade to something that has caught your fancy. 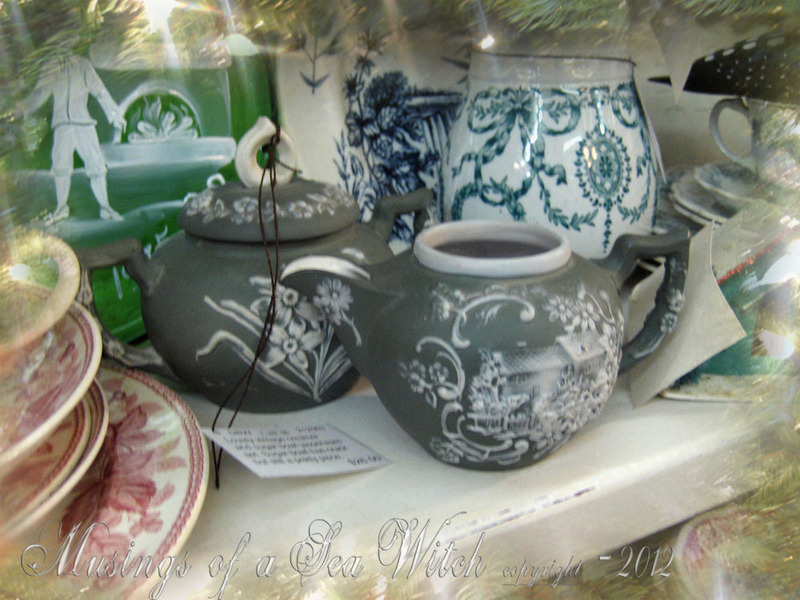 We are so close to the Christmas holidays and everyone is bustling with activity. 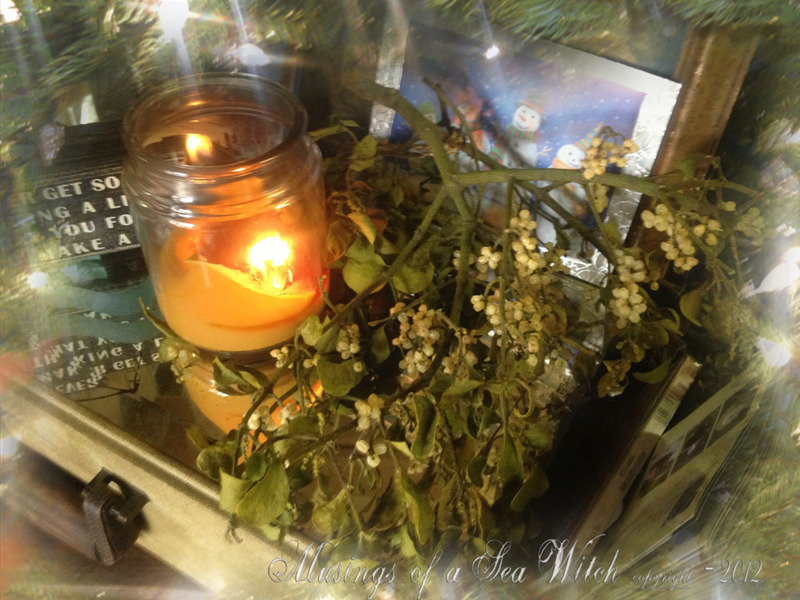 Remember the reason for the season and be kind to yourself as well. When the cooking is done and the decorating is up, when family and friends arrive and take over the house, stop, look around at all that has come your way and give thanks. There will always be others who have more and many who will have much less. Blessings to you and those you love. Can you believe it? It's December already. 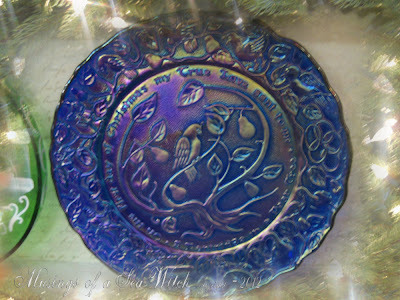 Had a lovely Thanksgiving visit with my son and his family in Denver and even got a little treasure hunting in as well. I hope the holiday was a great one for you as well. 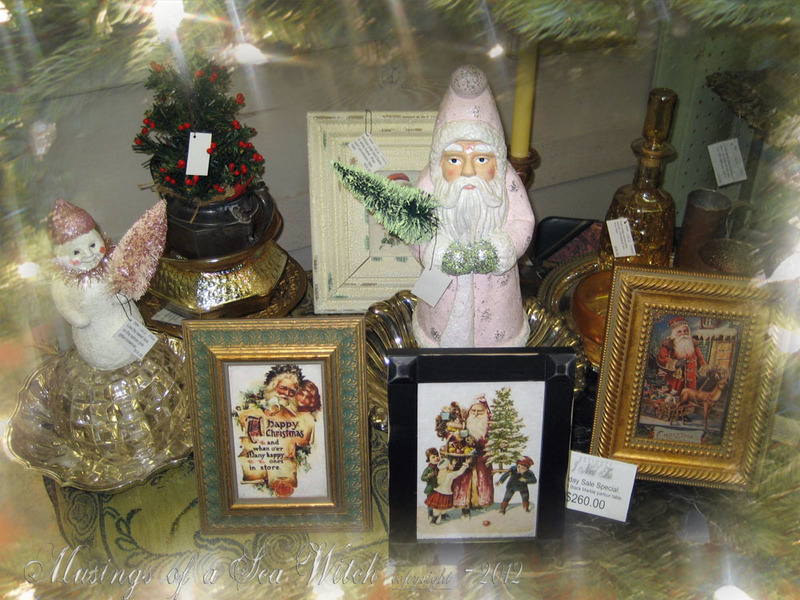 Now I'm playing catch up again on adding more inventory, pricing items, sprucing up the booths and preparing for more Christmas sales. 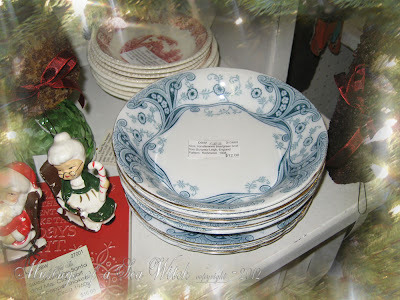 Found some nifty finds this weekend, unusual pieces for this time of the year as well. Found this buried in one of my boxes of Christmas items. I had thought I sold it all these years. 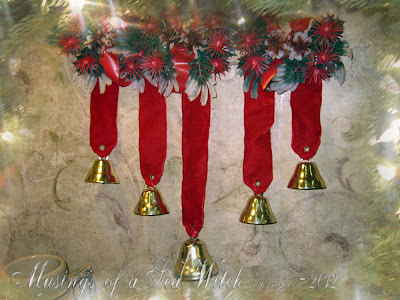 Very 1960s with plastic garland on a birch branch with bells. The definitive door hanger to announce when guests arrive. 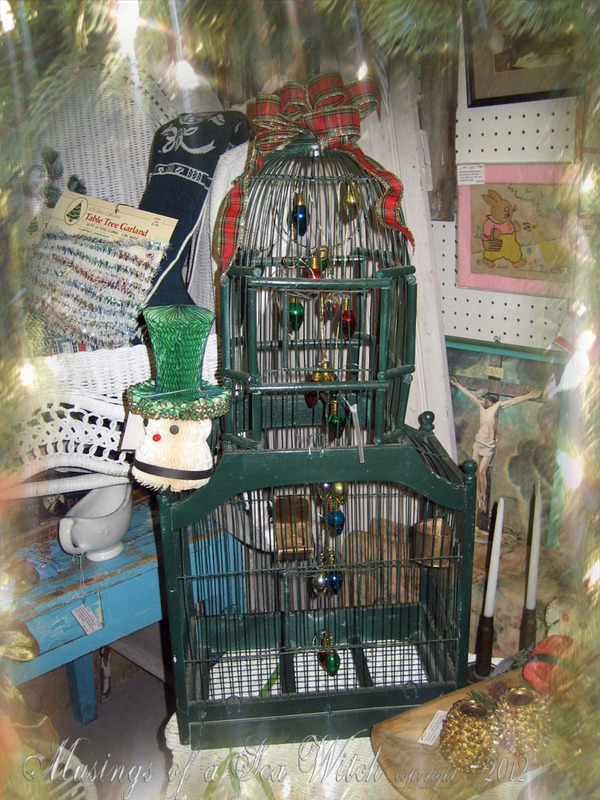 How lovely is this big, vintage wooden and wire birdcage? Original brass feeders are still intact and has two doors. I filled it with vintage Christmas balls and topped it with a pretty ribbon. 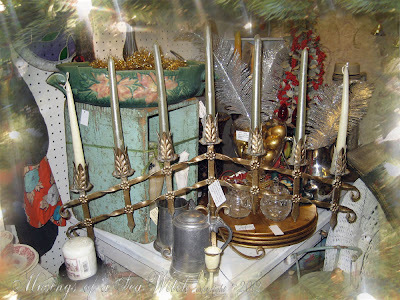 Pretty vintage, wrought iron tabletop or mantle candelabra is big and heavy. Holds 7 standard dinner tapers and has lots of layers of old paint. Really like this piece so if it doesn't sell, I won't mind. One of my best finds this weekend. A marvelous, original Currier & Ives hand colored print of "Little Charlie" and is dated 1874. 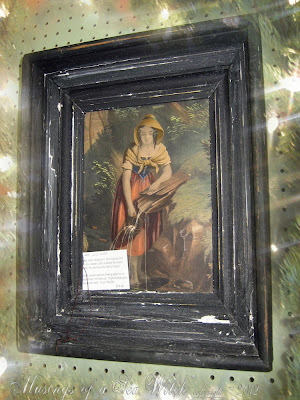 Original bubble glass and frame with wooden backing. The colors are brilliant and true. Vintage milkglass footed compote is filled with gold plated silverware. Everyone needs a happy gator with a Christmas ball in his mouth...especially if you are a "Gator's fan." Pretty little jasperware creamer and sugarbowl. 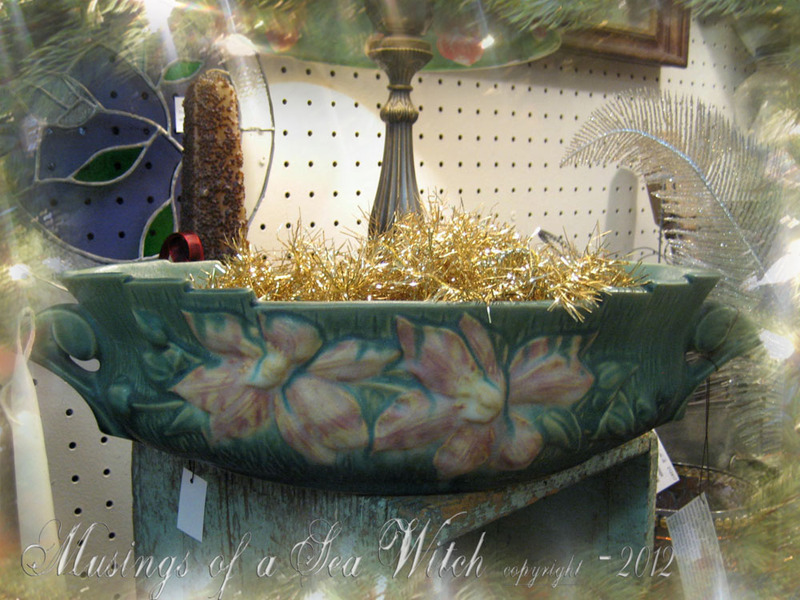 Soft sage green color with lovely details. 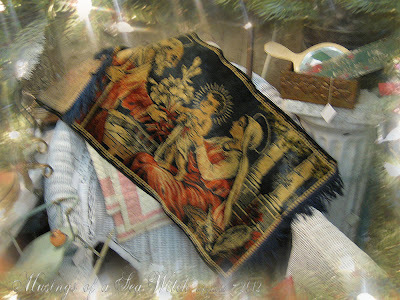 Vintage Holy Family velvet tapestry. Beautiful pair of late Victorian, pot metal, heavy candlesticks have been sprayed antique gold. 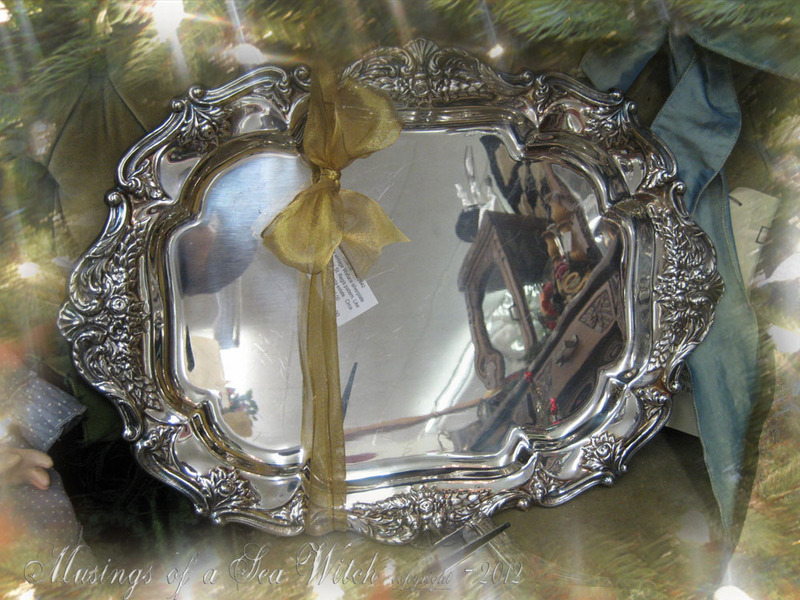 Exquisite silverplated tray by Wallace Silver. Large piece with highly polished surface, it is as brilliant as a mirror and looks like it was never used. Another super find this weekend, a gorgeous and hard to find Roseville, Clematis container. Their larger offering, this pattern was produced in 1944. 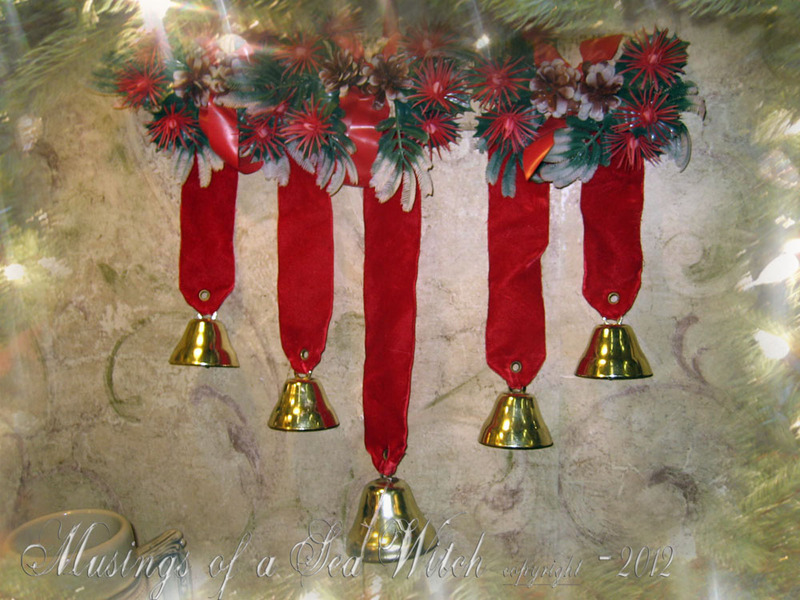 These actually look like poinsettias. It does have crazing and a small repair and a crack line, but it is a hard to find pattern in the matt pine green and the large container form. Brought in more Santa's as they seem to fly out the door. 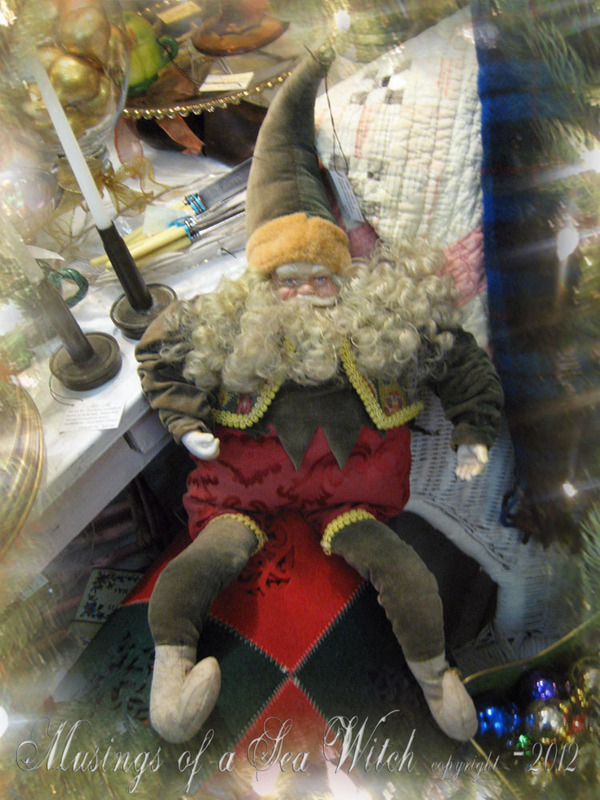 This jolly old elf is a nifty vintge piece that is a nice size. He lasted 24 hours before someone took him home. I love these wicker tiered servers. They have so many uses. Nice vintage piece in terrific condition. A second beautiful hand colored print in bubbled glass frame. I love these mid Victorian pieces and this pretty peasant woman is filling her table pitcher with cool water from a wooden flume. 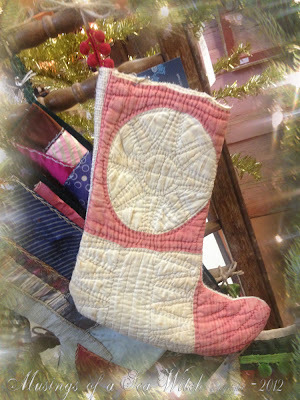 Pendelton blanket, Harley D stocking and pinup calendars came and went as fast as the vintage Santa. 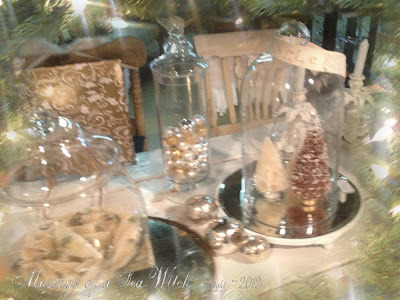 Vintage trees, wicker pieces and mica houses. Photo of my general line booth. Sold lots of items while I was visiting my Denver raviolis and had to fill in the empty spaces. 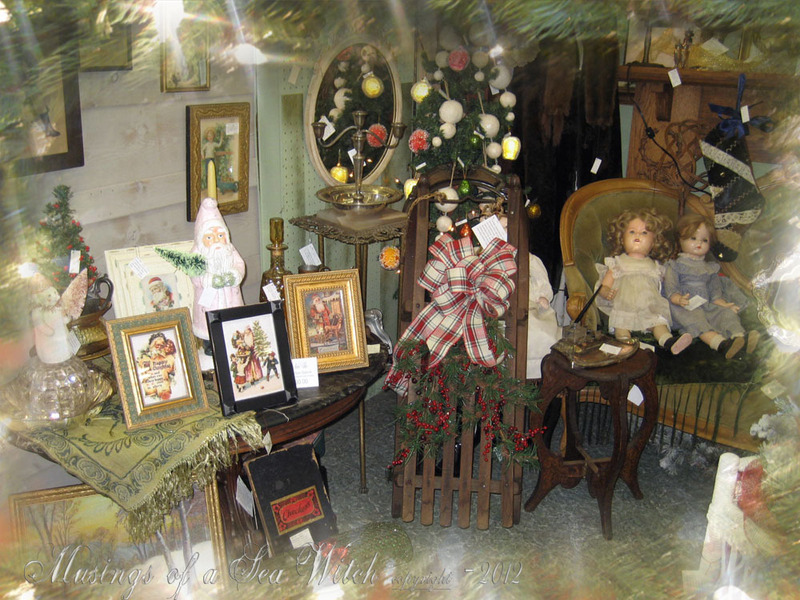 My Victorian booth continues to be my favorite. It is always fun to add period pieces to this booth. Sold several large pictures so had to bring in new ones. Moved items around to give the booth a fresh look.